Key national Jewish women’s organizations once brought women together through local chapters, but membership is declining steadily and, as more women began working outside of the home, the assumption of professional volunteerism became a thing of the past. Women wanted more meaningful roles than bringing the cookies to an oneg but the demands of managing professional and family life made significant community involvement more challenging. Within the synagogue walls, women’s hunger for meaningful spirituality was often not fulfilled by services and sermons that did not directly speak to women’s perspectives. Finally, many available roles just didn’t resonate: social action committees led to many wonderful activities to “help those poor people out there” but few addressed justice issues for women and even fewer turned inward to help Jewish women in need. In the early 1990s, twenty years after the formation of the battered women’s movement in the United States, a movement to address domestic violence in the Jewish community began to solidify. Although that movement did not set out with the primary purpose of “Jewish engagement” or “reaching the unaffiliated,” it tapped into an enormous unmet need and addressed that need through meaningful Jewish experiences that drew women into Jewish communal life with a passion. One of the earliest organizations addressing domestic violence from a Jewish perspective was Shalom Bayit, formed in 1992 in San Francisco. Founded to address a specific unmet need and break the silence about domestic violence in Jewish homes, Shalom Bayit serves an additional purpose as a locus of Jewish women’s organizing. It is a place where Jewish women find meaning and connection as clients, volunteers, and community organizers. Notably, Shalom Bayit’s work employs all four of Rabbi Sid’s principles for meaningful Jewish engagement in the next generation. Among the first strategies Shalom Bayit employed was ritual. In the early 1990s we pioneered the integration of Jewish healing into battered women’s support groups, an idea which spread nationally to become a best practice model for other Jewish domestic violence organizations. Using ritual and Jewish themes (e.g., gratitude during Sukkot or freedom from slavery at Passover), we leverage the healing and transformation built into our tradition, offering concrete tools for finding strength amidst trauma. Connecting the Jewish ritual and holiday cycle to Jewish women’s everyday experience has made Jewish spirituality deeply relevant for women. It sparked renewed interest in Jewish healing traditions, motivated women to learn more about Jewish teachings, transformed self-identified “secular Jews” into self-proclaimed “spiritual Jews” and created a body of feminist liturgy and healing rituals that turned Judaism into a tool for every day living. Shalom Bayit is a place where women who have felt alienated from Judaism — largely because of how the community has failed to respond / believe/ protect them when they reported abuse from their partner – can find positive, supportive Jewish community. We are often the reason that abused women reconnect to their Jewish identity: as a tool, as a sanctuary, as a place that now has new meaning and safety. The above strategies incorporate NPSCI’s theories of Jewish wisdom (chochma), the creation of meaningful community (kehillah) and lives of sacred purpose (kedusha). Leveraging Jewish wisdom to create change is a defining principle of Shalom Bayit’s work. Thinking Jewishly about life’s problems makes Judaism a relevant concept for modern-day living and gives people a bigger-than-just-me framework for approaching life’s questions. That’s why all our work is done through a Jewish lens, not only the direct healing work described above, but also our community education, teen dating violence prevention workshops for Jewish youth, parent education (on parenting teens towards healthy relationships) and even our organizational structure and bylaws. When we teach about domestic violence, it is more effective to lead a group through an experiential midrash activity than to educate through lecture. For example, instead of talking about “why women don’t leave” abusive relationships (although they do), if we ask an audience to re-enact a Red Sea crossing, they can suddenly identify with the barriers to liberating oneself from enslavement – including the fact that there is not usually a Promised Land once you leave. We teach parents to talk about Jewish ideas with their kids as another tool in the parenting toolbox. Each year over 1,000 Jewish youth tap into Jewish wisdom about relationships, respect, holiness and how we treat each other. Religious school teachers tell us that our workshops make Judaism come alive for students, as guidepost for everyday life. We strengthen Jewish identity by integrating life skills into Jewish education and by giving youth and adults Jewish tools to think about their own lives. Safe homes and healthy families are essential to any community. Yet one in four Jewish women will be abused by an intimate partner in her lifetime – the same rate as the general (non-Jewish) population. This is not only alarming, but also leads to this question: If a woman is terrorized in her own home, how can she possibly fully participate in Jewish life? And if she asks for help but is met with denial or disbelief, how can she possibly feel safe in Jewish communal spaces? Shalom Bayit creates alternative spaces for Jewish women (both survivors of abuse as well as volunteers and engaged lay leaders) to build community (kehillah), find purpose (kedusha) and seek safety, justice and healing (tzedek). We are protecting our community’s most vulnerable members and strengthening Jewish life in the place that matters most: the home. If women are to find Judaism relevant today, women’s safety must be seen as a central justice issue worthy of communal attention. As we demand that the Jewish community put domestic violence squarely on the Jewish social justice agenda, we create a Jewish community that is truly welcoming to women. Naomi Tucker is the founder and Executive Director of Shalom Bayit, an organization dedicated to building a Jewish communal response to domestic violence. 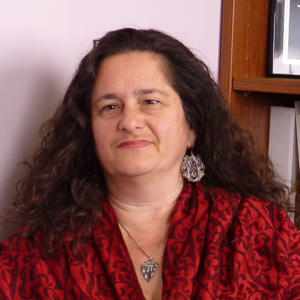 Naomi led the integration of Jewish spiritual healing into battered women’s groups in the early 1990s, and today works to ensure that Jewish women’s safety and empowerment are prioritized within both the Jewish social justice agenda and spiritual communities.